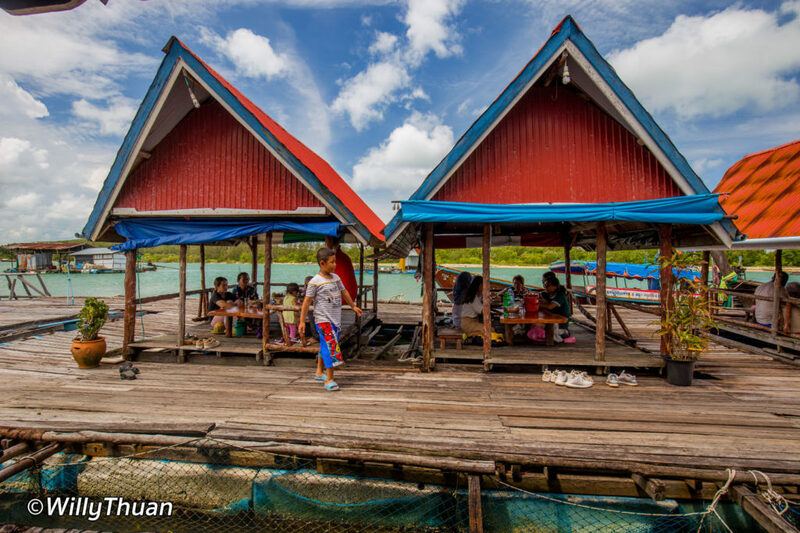 Bang Mud is one of the 3 floating restaurants on the east coast of Phuket island, just between cape Laem Hin and Coconut island (Koh Maphrao). 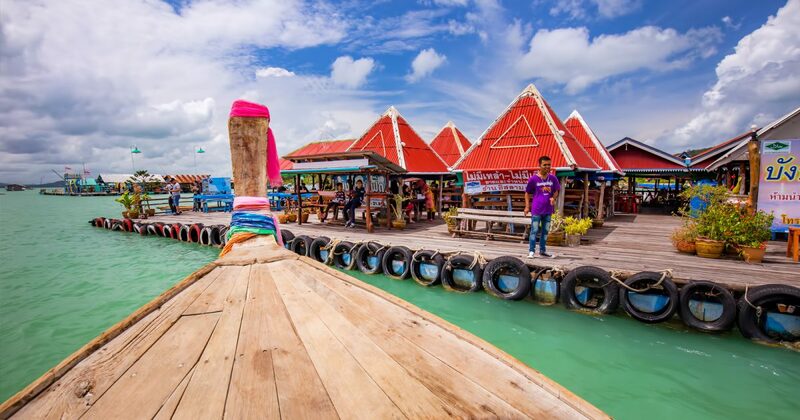 Floating restaurants are a fun and memorable way to enjoy a lunch with a view, or a dinner with a sunset. They are made of several huge floating rafts attached together with little wooden huts built on top. You can choose to eat like locals on the floor or at normal tables. It’s quite basic but that’s what makes the charm of it. 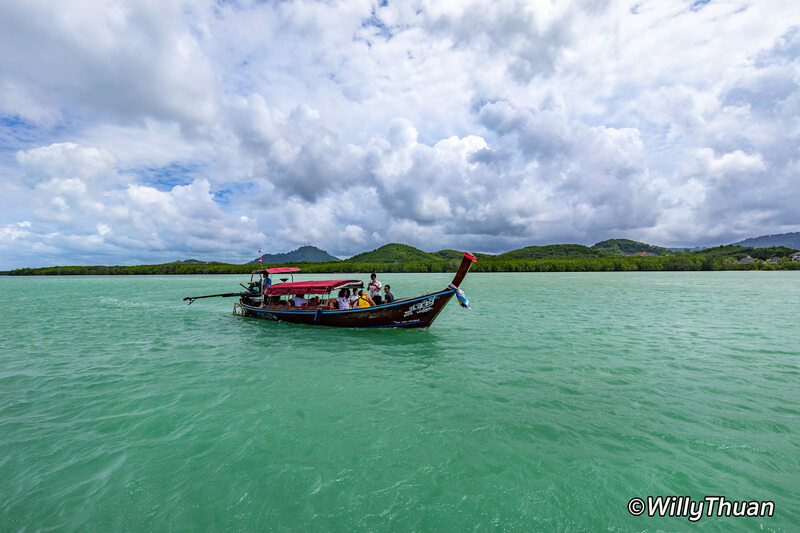 The views on the narrow sea between Phuket and Coconut islands combined with the cool breeze makes it a very enjoyable experience. The food is good and obviously fresh since the fish are kept in nets between rafts. You can see the cook come and go to pick up the seafood. 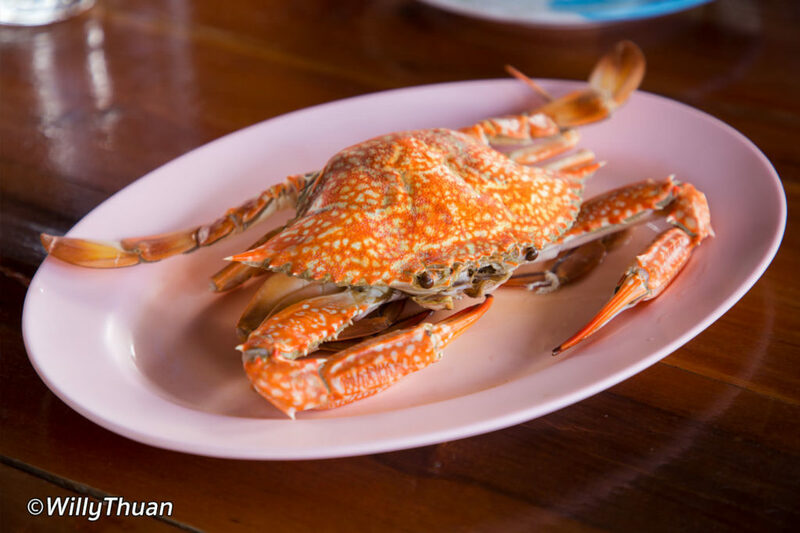 The blue crab is always one of our favourite and you should try it if you are too a crab lover. It’s very easy to open and the meat is surprisingly sweet and fresh. Pick a big fish and have it cooked the way you like it (photos on the menu are very useful for that) steamed, grilled or deep-fried. Order one of their soups (they have a lot more than the classic Tom Yam or Tom Ka) and you’ll have a perfect meal! Just remember that Bang Mud is a Muslim restaurant and therefore they don’t serve alcohol. Being on the east coast, Bang Mud is far from Patong, Kata or Karon, about 20 kilometers of 30 minutes drive on a good day. It’s a nice place to go if you have your own wheels, ideally a car but it’s feasible by motorbike too. Sure, any tuk tuk will take you there, but you will need to ask him to wait for you for the return, Laem Hin is on the west coast. Once you reach, there is a dedicated (paying) parking. From there, walk to the short pier where you will easily spot all the longtail boats. Just say the name of the restaurant and someone will wave at you. The ride is short, safe, fun and free! The boat will drop you at the restaurant and another one will pick you up after dinner. Giving a small tip the pilot is a nice gesture, even just 20 baht. Mag Mud good but is not out favourite. 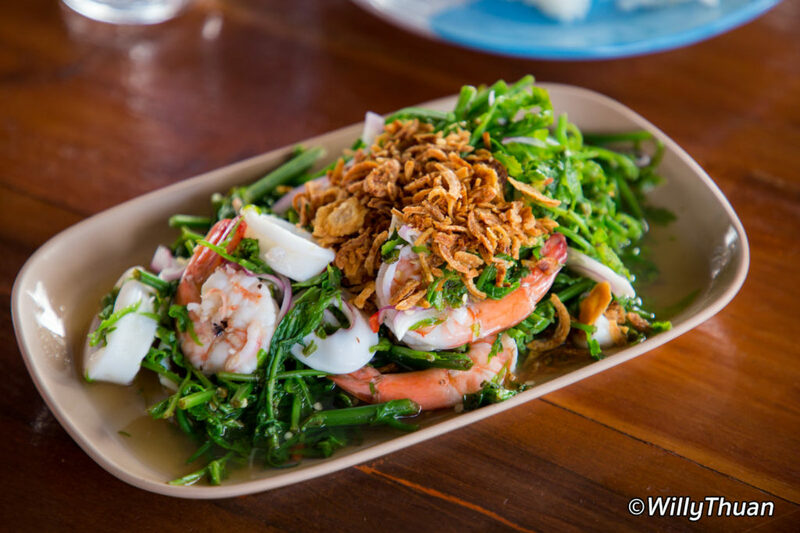 However it is a nice change if you have been to Kruvit Seafood or Laem Hin Seafood before or if you need to eat Halal food. 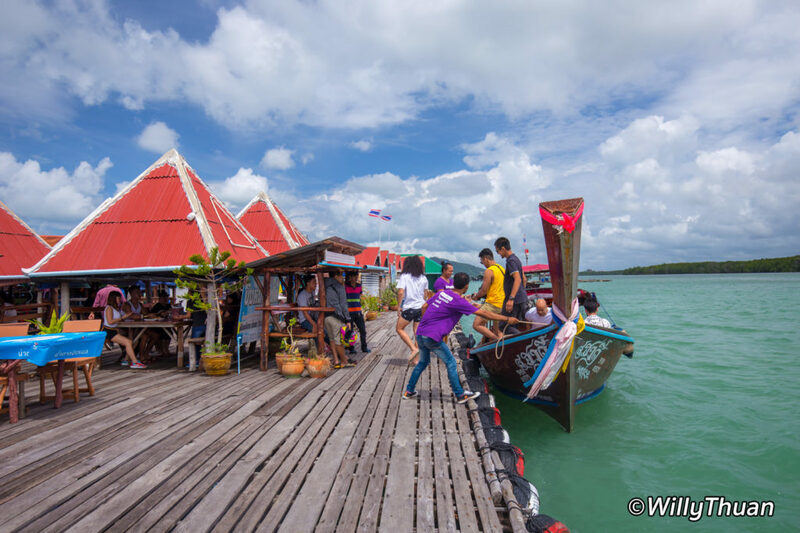 You have to keep in mind that all the floating restaurants are a bit more expensive than local seafood around the island as everything just be carried by boat.